The Monitor is the visual display screen where images produced from camera, video player,or DVR video signal can be seen. Resolution specification determines image quality and therefore amount of detail that can be seen. Most vehicle camera kits we supply have colour TFT monitors. Monitor size can be specified for your application. Observation systems with multiple camera video inputs to a single monitor displaying quad images can be supplied particular useful for crop flow monitoring through agricultural harvesting machines. Monitors can be specified with selectable camera input to display the image from one camera only at a time. This is sometime less confusing to the operator. Audio enabled monitors are available where sound monitoring of camera area is required. Screened cables help to shield and reduce interference which may disrupt picture quality. Camera cables often use either 4 pin aviation connector , RCA connector, or old type video-S connector. Wireless Camera Systems are quicker and easier to install. Analogue wireless cameras may suffer from interference and signal loss over long range therefore Digital Wireless Camera Systems are recommended. Standard or Lcd colour monitor and camera systems for safe reversing risk reduction / load flow monitoring applications. Typical use in public service vehicles , taxi, monitoring applications. To comply with Data Protection a warning notice should be displayed when using video recording camera systems. Risk assessment requires enhanced vehicle, operator and public safety by increasing visibility around the working area. High visibility is particularly important for emergency ,utility, municipal & construction service personnel whom may be working at the roadside and at particular risk from fast moving road traffic. 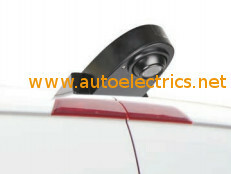 Driver or operator vision can be improved when reversing or turning by fitment of a vehicle monitor and cctv camera system which may be ignition switched to activate when the engine is running or switched by a reverse gear selection or camera switch. 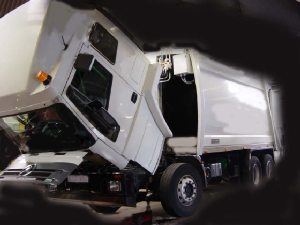 A monitoring system can also prove useful during loading / unloading and processing operation for example on Waste collection, tipping, combining, baling etc. where material flow needs to be monitored. Environment where cctv is to be fitted should be considered particularly in Agricultural, Construction, and Industrial applications. Chemicals such as liquids, gases, fuel, oils, grease. The IP rating of the camera kit is a two digit code referring to Ingress Protection against dirt dust and moisture. First digit of IP code refers to ingress protection against solids eg Dust. Second digit of IP code refers to Ingress protection against moisture. Higher the rating generally provides best protection. CCTV in taxis and private hire vehicles can be used to help prevent crime and enhence driver and passenger safety. Useful guidelines are published in the Transport for London document guidelines for cctv in taxis and private hire vehicles (download link pdf). Prior approval is usually required from local licensing authority before installing cctv recording systems in hackney carriage and private hire vehicles. System approval may also be required together with appropriate data protection licensing.